Over many years of building and performing home inspections, I have seen a lot of doors poorly or improperly hung. The reasons for this vary; poor craftsmanship, rushing what should not be rushed, damage after proper installation from a sub-contractor, even the installation of an improperly sized or damaged door because “they just couldn’t wait” for a replacement and were told to make it work. No matter what, a door is interior finish. It is what the owner, customer or buyer sees and operates when they go through the property. It needs to be done right or not at all in my opinion. There are many types of doors, and there are many techniques for proper door installation. I’m not trying to start a debate on installation techniques, just illustrate what is good about this one and how the finished product should look and function. 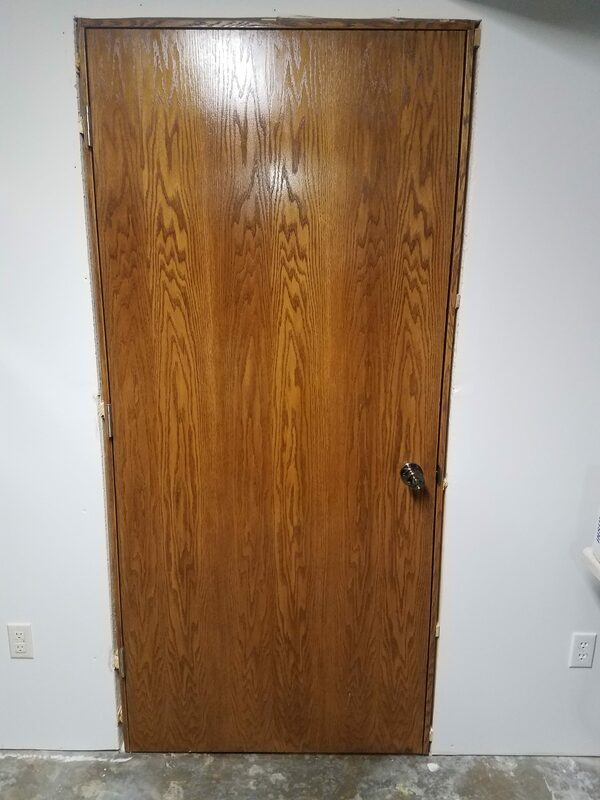 Here is an example of a properly hung door. The door in the picture is a pre-hung interior door. This means that the door, door frame and hinges come pre-assembled which makes for an easier installation. Here are a few bullet points to show what’s correct about this installation. Note that the “reveal” (gap around the perimeter of the door) is almost perfectly even from top to bottom on both sides and across the head jam. This is more difficult to achieve on a cheap press-board door frame than a higher quality plywood frame. Either way, a poor reveal is illustrative of poor craftsmanship and typically results in improper door function, e.g. rubbing on the jam or hinge binding. Improper framing of the rough opening can greatly impact the ability to achieve a nice reveal and functional door. Framing adjustments should be made if possible, rather than trying to “make it work”. A good foundation is key in all aspects of construction. Note the shims are holding the frame perpendicular to the wall and are placed strategically along the length of the door frame and head jam to keep the frame straight and true. This is what keeps the reveal described above nice and even. It also makes for easier installation of the casing around the door when the time comes to install it. A trim carpenter will appreciate a good door installation that doesn’t need to be messed with! The proper installation of shims and frame alignment also serve to prevent the door from becoming hinge bound. A hinge bound door will resist closing as the lock set nears the strike plate when closing the door. A properly aligned door will swing shut with ease and not require any extra effort. You can’t see it, but there is a single 3” screw in each hinge tying the door frame to the adjoining stud. A good carpenter will pre-drill these so not to deform the frame when tightening the screw. Also a single screw on the latch side hidden in the strike pocket is a good idea to bolster the strength of the installation. This will help keep the frame in place in case the door is slammed due to breeze or what have you. Notice that the shims are cut flush with the frame and the frame is flush with the drywall. This makes for a nice easy installation of the casement for the installer or trim carpenter. Improperly installed doors are difficult to case out. There may be some swearing from the trim carpenter. Lastly, note that the door frame is not in contact with the concrete floor. When installing a door, floor covering must be considered. Typically on hard surface floors, the door will be installed after the floor for a nice fit to the bottom of the frame. If carpet is used, a piece of base board can be used to hold the frame up off the sub floor so the carpet can be properly rolled under the frame onto the tack strip. In this installation, an unfinished basement, there is no floor finish so the door frame was kept ~ ½” above the concrete to prevent moisture from wicking up into the frame. Wicking moisture may cause rot or mold to occur. No construction material, save treated lumber should be in direct contact with concrete floors as moisture damage may occur. Ultimately, doing things right the first time will benefit you and those that come behind you, be it other craftsmen, clients, buyers or anyone who cares to notice. I hope that this article helps you better understand door installation, in case you ever decide to or need to install a door.